You can shuttle music from iTunes to your iPod but you cannot copy music from your iPod back to iTunes. This is very annoying to a lot of iPod users. The restriction is to prevent music piracy, but when the solution to a problem becomes another problem in itself (for legitimate users) then it's time for a better solution. Here's a problematic scenario: you accidentally erased a song from your computer but you still have the song on your iPod. If you go through iTunes, there is no way to get the song from your iPod back to your computer's hard drive. The song is basically stranded and abandoned on your iPod. A hard drive crash is even worse, as you've lost all your music on your Mac, the frustrating thing being that you have all your music still on your iPod with no way to get it back onto your new hard drive (always backup!). Well, since going the iTunes route is no help, there is a utility that can easily pull your music from your iPod back into iTunes, and it's called xPort (download here). xPort couldn't be easier to use. Once installed, plug in your iPod and run it. On a side note, xPort is compatible with most incarnations of Apple's iPod. You will see all your music listed in the xPort main window. 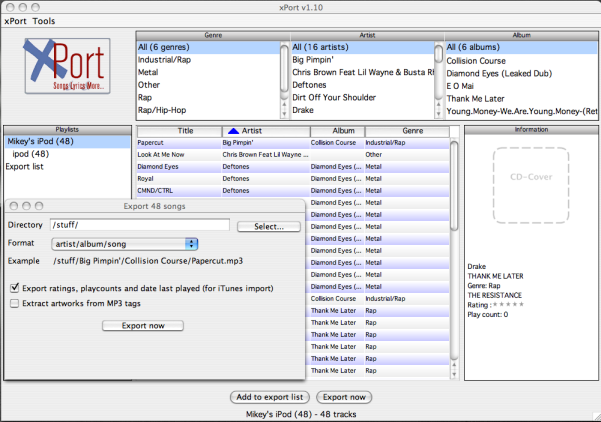 xPort also conveniently lists your music by Genre, Artist, and Album in the upper part of the interface. Select the songs that you want to transfer back into iTunes from the list. Once you've selected all your music that you'd like to transfer back, push the "Add to export list" button at the bottom of the window. Click on the "Export list" playlist on the left side panel to view and verify your exported songs. Next, push the "Export now" button and an options dialog will pop up. You'll be able to select the directory to save the export list in along with selecting an option to not only export your songs but also each song's information, such as ratings, playlist count, date last played etc. After you're done, hit the "Export now" button and watch xPort do its thing. There's a progress bar to watch so you won't get bored. After xPort is done, you'll have an xPort playlist that you can import into iTunes. To do this, go to "File", "Library", and "Import Playlist" inside of iTunes. That's all there is to it! One of the limitations of iTunes is one-way transfers. You can transfer music from iTunes onto your iPod but not vice versa. This becomes a problem when you no longer have a song on your computer but you have it on your iPod. How do you get it back? The solution is a program called xPort, a nifty utility that can transfer music from your iPod back into iTunes. Tip: You may be also interested in How to backup your iTunes Library onto an external hard drive?